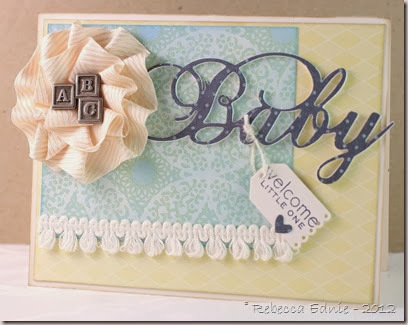 I made a baby girl card last week so this week I had to balance it out and make a boy card! I wanted to play with The Shabby Tea Room challenge this week too so I merged the challenges. The papers are from Webster’s Pages, I deepened the aqua and blue paper with some blue ink because I wanted more contrast. I started with a yellow card base and inked both the base and yellow paper with Harvest Gold ink but the look was brighter than I wanted. So I saved that base and paper for another card and started again with an ivory base and inked both the paper and base with Frayed burlap ink. Ahh, much better. 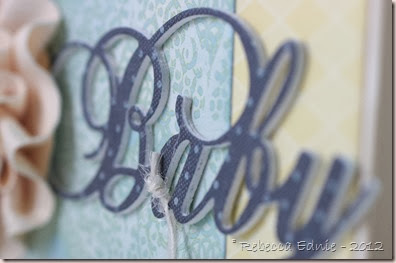 For the Baby die cut, I layered and adhered 4 cardstock die cuts before adding the final patterned paper layer. It’s about 3/16” thick (between 1/8 and 1/4”) so about the same as if it was chipboard. I made the ribbon rosette by putting red line tape on a circle of scrap cardstock but it still overlapped in enough places that it didn’t want to stick everywhere. So I added a few staples between the layers just where it wouldn’t stick and one at the end right under where the blocks ended up. I knew I was going to place something in the middle that would cover. Wow, I finally made a card without changing the sketch much at all! I think the only think that is different is I rearranged the layers a bit. 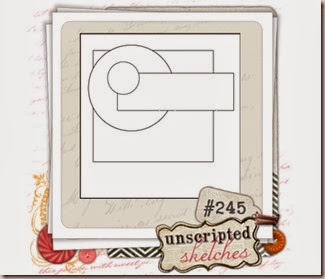 But that’s the awesome thing about Unscripted Sketches! You can do with it whatever you like! Follow it to the letter, change it, rotate it or flip it! It’s up to you! And remember, it’s not a card challenge blog, make whatever you like! I hope to see you there! Ink: frayed burlap distress, night of navy, bashful blue-SU! 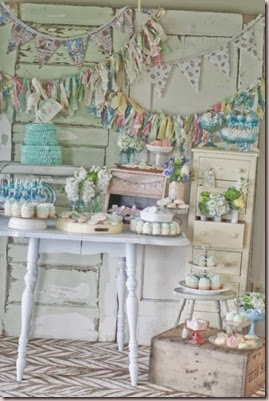 Gorgeous shabby card. love the ribbon rosette!